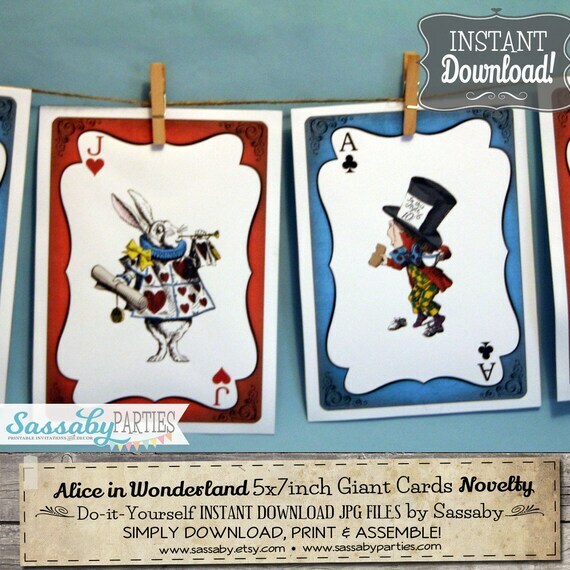 It's a set of do-it-yourself PRINTABLE JPG 5x7" Alice in Wonderland Giant Playing Cards. ✔ These INSTANT DOWNLOAD .JPG files will be available on your Etsy account after purchase. ✔ This item IS NOT a Full Deck of Cards - 6 Characters included. ✔ Digital downloads are not compatible with the Etsy App. ✔ NO actual items are shipped by mail. ✔ By purchasing you are agreeing to our shop POLICIES (available to view at the tab above) and you are stating that you have read this product description FULLY. ✔ NO colour changes can be made. Colours may vary between different monitors and devices. ✔ You may print as many copies as you need for your own personal use. ✔ All files are in ENGLISH and cannot be typeset in another language. · 3 x sheets* of two 5x7" Giant Character cards per page JPG files. · 1 x sheet* of two 5x7" Pink & Blue backing page JPG files. · 8 x Single 5x7" files of Each Character & Backing cards JPG files. Six (6) Alice in Wonderland Characters are included in the 5x7" designs: Queen of Hearts, King of Hearts, White Rabbit, Alice, The Mad Hatter & 5 of Spades. *All 'sheets' are formatted as 8x11" with two 5x7" files to a page. Suits US Letter & A4 paper sizes. 2. DOWNLOAD the digital .JPG files from your Etsy account using a computer and by referring to the instructions on your download page for more information. 3. UNZIP your files by referring to the instructions on your download page for more information. 4. PRINT at home*, or at your local professional printing shop. Files are NOT RECOMMENDED for use with Smart Phones, iPhones, iPads or Tablets as they cannot be UNZIPPED/SAVED correctly. YOU MUST USE A DESKTOP COMPUTER. Open & View your JPG files, simply double click on the file in it’s saved location, your computer will then choose the best default program on your machine to open & view the file. (For example: If you have a Mac Computer, and you double click on your saved JPG file in the Finder, it will open the file in Mac Preview, allowing you to View & Print). PRINT at home, or SAVE to a USB FLASH DRIVE and print at your local Professional Printing Store, or UPLOAD to an Online Printing Service. We recommend PRINTING your items on white CARDSTOCK PAPER that is at least 170gsm in weight or heavier. All Sassaby Party Co. designs are for personal use only. You may not forward, share, sell or re-distribute any of our digital files. All designs are sold for non-commercial use only. © Copyright The Sassaby Design Co. 2017. All Rights Reserved. DISCLAIMER: All IMAGES & GRAPHICS used by The Sassaby Party Co. are in the PUBLIC DOMAIN and are ROYALTY FREE to the best of our research and knowledge. The Sassaby Party Co. DOES NOT condone the practice of re-selling licensed images of any kind. We take no responsibility for professional printers who refuse to print our products. We have done our best to ensure our products are not infringing copyright, however cannot guarantee that all professional print stores will agree to print our digital files. We will not provide refunds or compensation for any issues that may arise in regards to printing or copyright issues. No physical item will be shipped. This purchase is NON-REFUNDABLE and all Sales are FINAL. ➥ PLEASE CHOOSE CAREFULLY all items are NON-REFUNDABLE and all sales are FINAL.